Barbecue grill grease trays and cups collect excess grease and drippings, channeling them away from burners. It is important to regulary empty the grease tray and cup to prevent overflow. Over time, the grease tray may weaken or rust, in which case it should be replaced. As BBQ grease trays and cups come in all shapes and sizes it is very important to select the ones that are designed to fit your brand and model of barbecue. 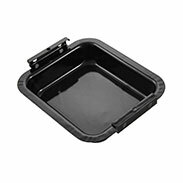 Grill Spot offers the largest selection of Barbecue Grill grease trays and grease cups in Canada. If you can't find a part or accessory, just contact our friendly customer care team. We're here to help!